Our beautiful wedding photographs were taken by my very talented little cousin Rebecca Christink who worked so artfully to capture so many beautiful images. Our ceremony began early evening, performed by our favourite priest, Father Murray. 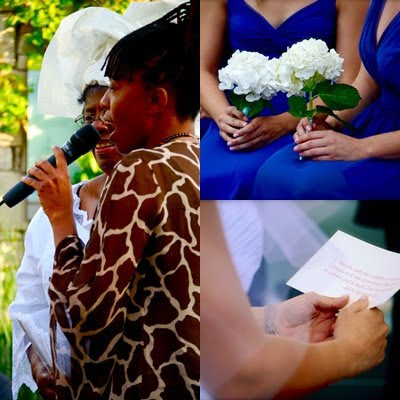 It was such a special experience to be surrounded by so many loved ones, and such profound, meaningful words. Andrew's Aunt Marcey and Ambuya (Grandma) rose in song from their seats, offering a blessing in Shona, followed by an Irish love song Andrew's grandfather used to serenade his grandmother with. Immediately after the ceremony, cocktails and appetizers were served (Andrew's mum's famous rum punch). 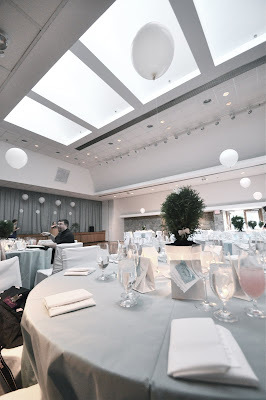 The room was decorated in all white with Tiffany blue accents and lace. The centrepieces were small hedges adorned with butterflies I'd cut out of iridescent velum (they glow in candlelight...). On each place setting was a Thank You note with a special message from Andrew and I to all of our guests. Our lovely favours with homemade Molasses Cookies from my Nana Ruth's recipe (a family favourite she'd brought home from Zimbabwe). We were lucky enough to have wedding cupcakes made by my favourite new bakery in town, Desmond & Beatrice - they were absolutely heaven - perfect, buttery richness, and even with a little sparkle! My husband was asking for them on our way to the hotel after the reception. If you live in Toronto - place your order quick, quick, quick! At the end of the day, it was a magical, memorable experience. I absolutely love that shot with the balloons. So gorgeous! You looked beyond lovely. And everything was very you! It was awesome to see a lot of your aesthetic translated in reality for the wedding. Oh the last shot of you holding the balloons is so artistic and lovely! What an inspiration for those of us with upcoming weddings---thank you so very much for sharing your special day. Yay! I've been waiting for these!! Everything looks just beautiful, Shar! I knew it would given what great taste you have. I really love the last photo of you two and the balloons. Congratulations (again!) and thanks for sharing your day with us. Gorgeous! That is no surprise though. I especially love the last picture! Your wedding looked absolutely gorgeous. I especially love the cupcakes and the bridesmaid's dresses. Congratulations on your wedding. Everything looks wonderful! Congratulations!!!!! 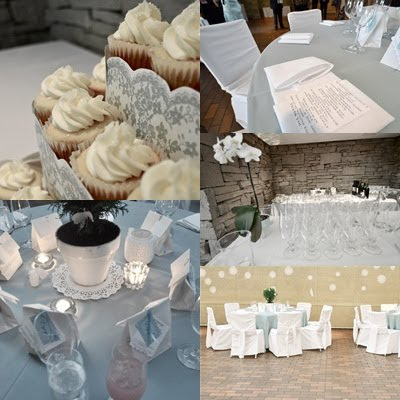 Your wedding looks like it was nothing short of magical and a great evening of fun and love! wow. what a lovely wedding. thanks for sharing. it sounds like it was meaningful and memorable. Thank you all so much for so many lovely, kind comments! It truly was an unforgettable day. gorgeous, everything is gorgeous! that last photo of you two is fantastic and those cupcakes are making me drool. Oh my goodness, thank you so much! You flatter me! Your comments completely made my day! Ah! Lovely!! Those balloons worked out so well... aww great pics! dreamy images! definitely looks like a very special day. i do love the cupcake pic. Thanks Daniella - the balloons were some of my favourite shots. Thanks Cathie - wish you were closer, I'd give you a cupcake!